So many friends getting together and having a blast at Phish! Atlantic City is the perfect place to see Phish! I enjoyed the new album Wingsuit and I cant wait to hear some of the new songs like 555 and Winterqueen jammed out! Thanks so much to everyone who came out to see us at the Phan Art Poster show at Caesars as well! 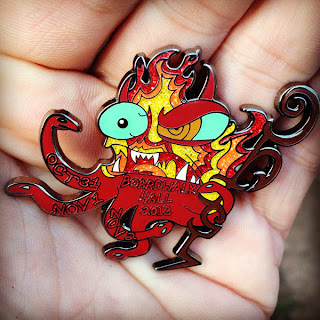 Check out the Squidbillies Phish Pin I made for Halloween!